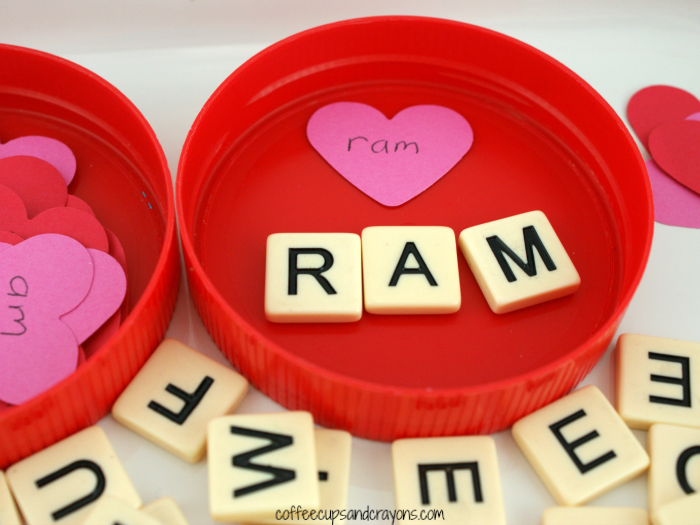 Practice spelling words with a Valentine’s Day twist! 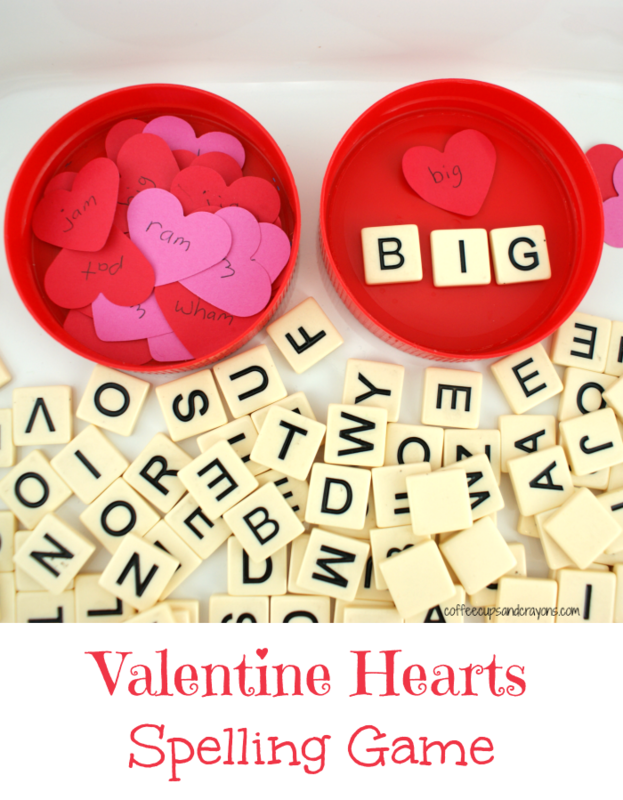 Kids will just love this valentine hearts spelling game. This game actually combines two of our previous games (Raining Hearts Word Game and Draw a Letter Matching Game). My son was having so much fun with the hearts I wanted to extend the learning further. We’ve been working on word families. Aiden chose a new word family to practice and I added in the hearts from the raining hearts game as well. We used the following word families: -at, -am, and -ig. You can practice any words you want – sight words, spelling words, whatever works for your child. 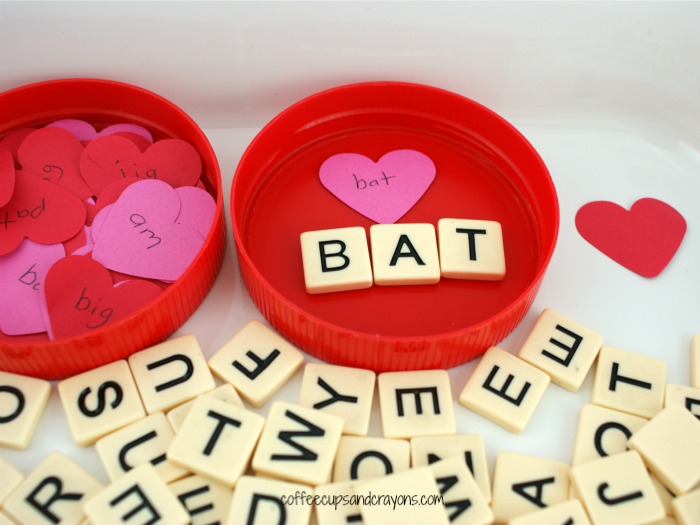 Place the letter tiles in a large enough container that they can be spread out easily. Have your child draw one heart from the pile and read the word. When my child struggled, I asked him if it was an -at word, an -am word, or an -ig word. He then could sound out the beginning letter and combine it with the ending. Find the letters in the word drawn and spell out the word. Continue playing as long as your child is interested! I didn’t do this intentionally, but I love that I have lowercase letters on the hearts and capital letters on the letter tiles. It makes for an added piece of learning. You could also write only one letter on each heart and practice letter recognition or letter sounds. Melting Hearts Word Search – This activity combines a love of fizzy reactions with literacy skills. 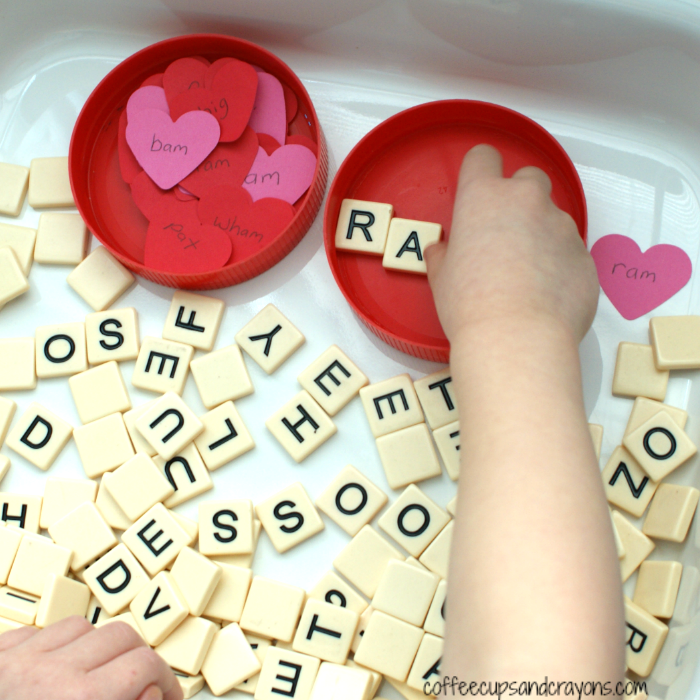 Letter Matching with Hearts – The hearts make these lowercase letter games extra fun. Raining Hearts Word Game – Get jumping and reading in this fun heart themed game. Vowel Sounds Practice Game – Make phonics practice fun with this game that uses cups.